Android Asset Studio – The easiest way to create icons for your android apps! Android Asset Studio is an online utility that lets you generate all kind of icons you may need for your android applications, starting with launcher icons, action bar and tab icons, notification icons, and menu icons. It even includes a simple 9-patch generator allowing you to create 9-patch images. One of the trickier parts when creating the icons is that you should create them for all kinds of resolutions: ldpi, mdpi, hdpi, and xhdpi. With Android Asset Studio this is as simple as uploading an image. 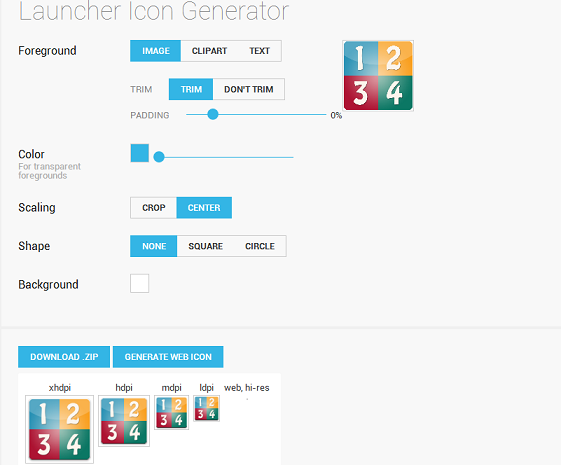 The tool generates automatically for you all the versions of the icon under all resolutions, and make them available as a downloadable zip archive. The icons may be generated from an image uploaded, or from a clipart library, or from text. It’s a very convenient tool and I highly recommend using it if you want to have professional, good looking icons on all resolutions. Reblogged this on All At One. Your blog is great as usual BTW we at Decoding have moved from decodingc.wordpress.com to http://decodingtech.com .. We miss you on our blog 🙂 Keep up the good articles here.